Recent escalation of violence in Côte d’Ivoire has proven that the wounds created in the civil war have not healed and remain open. Let’s see what the origins of the conflict are in the once most prosperous country of West Africa and how the international community has reacted to the deterioration of security after last year’s elections. Alassane Ouatarra, president of the political party Rally of the Republicans (RDR) and the internationally recognized president of Côte d’Ivoire, is fighting Laurent Gbagbo, president of the political party Ivorian Popular Front (IPF) and president of Côte d’Ivoire between 2000-2010. After the victory of Ouatarra in the elections held in November last year Gbagbo refused to leave power claiming that the election results had been rigged. Côte d’Ivoire has been in turmoil for almost a decade. It was split into a rebel-controlled north and government-controlled south after an attempted coup, led by northern rebels, sparked a civil war in 2002. A ceasefire agreement was reached on 3 May 2003 and since then 9,000 UN peacekeepers monitor the fulfillment of the ceasefire. 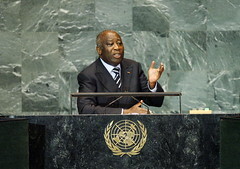 Gbagbo agreed to hold a national presidential election in 2008, which was ultimately postponed until 2010. What is the military force of both sides? The numbers of forces of both the sides are only estimations. Laurent Gbagbo relies on the Ivorian state’s official military and police forces, which are estimated at around 50.000 and have traditionally controlled the south of the country. These forces, however, seem to have change sides with the latest offensive of Ouattara since many high military officials have appeared on the national television proclaiming their obedience to the internationally recognized president Ouattara. The real strongholds of Gbagbo are the two elite units: the 1,500-strong Republican Guard and the 2,000-strong Cecos special forces of the anti-robbery brigade. These forces seem to be the only forces still loyal to Gbagbo and are defending the presidential palace in the country’s main city and former capital Abidjan. Ouattara, on the other hand, is backed by the New Forces, which traditionally hold the north of the country and are led by his Prime Minister Guillame Soro. Their number is estimated between 5,000 and 10,000. Ouatarra, originating from the North of the country, has been trying to distance himself from the northern rebels who fought a brief civil war almost a decade ago that started with their attempt of a coup d’état. The rebels now claim that they are supporting him on their own will and are going to continue doing so until the elected president is able to assume office. As was expected by the experts, with the outbreak of fighting, both the pretenders are relying on a hard-core of well-trained armed troops which amount to only a few hundred armed men each. What are the origins of the conflict? As is common in civil wars the origins of the conflict are complex and have their roots in different sources. In the case of Côte d’Ivoire they can be broadly divided into 4 main factors: economic, social, political and external. 1. Economic: The outbreak of violence could be associated to the uneven distribution of economic development between the north and the south. Part of this is because the successive governments have paid more attention to the southern regions where also all oil deposits and refineries are located. Another reason is due to the early colonial developments where the south benefited from early foreign traders and Christian missionaries who settled along the coast and therefore contributed to the economic and commercial development of the south. 2. Social: More that 21 million inhabitants, in a country roughly the size of Norway, are divided into more than 60 ethnic tribes, grouped into four major linguistic families. There is a perception among the northern tribes that the southern tribes have been ruling Côte d’Ivoire to their advantage. Furthermore, the situation is worsened by the sectarian tendency of the regimes; the northerners for instance, complain that they are being marginalized and discriminated, denied passports and even national identity papers despite being citizens. To this we need to add the factor of the immigrants, originating particularly from the northern neighbouring countries of Mali and Burkina Faso, which represent a significant part of the population, amounting in 2005 to nearly 2,5 million (11,2% of the total population). They have been competing for resources and land, which has provoked tensions with local population. Religious problems are not as endemic as in some other African countries but can nevertheless stir the already existing inequalities. These were not caused by religion, but since the religious differences coincide with the north-south dispute – the north is mostly inhabitated by Muslims and the south by Cristians – the already existing inequalities are easily connected to religion. 3. Political: Since the political space opened to all opinions in 1990 the political power competition grew between the leaders of political parties. You might say that this is no different to any modern western democracy, but in Côte d’Ivoire the political rivalry resulted in repression of the political opposition through arrests and detentions of its party members. This provoked frustration in the opposition and the fact that it coincides with failure to control the behaviour of the armed forces could have contributed to the need for military coups and the eruption of the civil war. 4. External: Many experts believe that the security situation in Côte d’Ivoire is closely connected to the destabilization of West Africa in the last two decades, particularly in countries such as Liberia and Sierra Leone which suffered brutal civil wars at the turn of the century. Currently the situation in these countries is relatively calm, but we need to understand that many rebels from those wars have not been reintegrated into the society and are joining the conflict in Côte d’Ivoire as mercenaries. Together with the recent escalation of violence the humanitarian situation has been rapidly deteriorating. According to The International Committee of the Red Cross, “the country is now in the throes of a full-fledged internal armed conflict”. Tens of thousands are fleeing the fighting and are constantly on the move, which makes it especially difficult to organize relief and to estimate their numbers. Over 100,000 refugees have also found shelter in neighboring Western African countries, particularly in Ghana and Liberia. Probably the worst news we have received so far is the eruption of inter-ethnic violence in Duékoué where at least 800 people were brutally killed on Tuesday, the day after Ouattara’s forces took over this town in the west of the country. 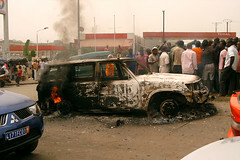 What has been the reaction of the international community on Cote d’Ivoire’s situation? Neither Iraq nor Somalia, Sierra Leone or Libya: in the last two years no other country in the world has received more attention, and obtained more consensus, by the United Nations Security Council than Côte d’Ivoire. In 2010 the country deserved the adoption of seven Security Council Resolutions (out of a total of 59) appealing for action regarding the situation in the African country. This year three Resolutions have been adopted so far regarding the country’s situation, which is even one more than Libya. All ten Resolutions were adopted unanimously by the members of the Security Council. The contents of the Resolutions called for improvements in the elections’ process and more transparency to bring a credible electoral process in Côte d’Ivoire. Resolution 1911 (2010), adopted in January 2010, stressed that the country ‘continues to pose a threat to international peace and security in the region’. In its latest Resolution (Resolution 1975, adopted on March 30) the Council demanded that Laurent Gbagbo stepped down as President, allowing for the internationally-recognised president Alassane Ouattara to take power, and imposed sanctions on him and his close associates. The Resolution was sponsored by France (Côte d’Ivoire is a former French colony) and Nigeria after the Economic Community of West African States (ECOWAS) had urged the Security Council to revisit the situation in Côte d’Ivoire in response to the rapidly deteriorating political, security and humanitarian situations in the country. Both sponsoring countries are, by far, the largest commercial partners of Côte d’Ivoire. The European Union (EU) has been especially active on the call for action in the African country. Five pronunciations in the last month have been carried out by the EU High Representative, Catherine Ashton, on Côte d’Ivoire’s issue. The United States has also strongly condemned Laurent Gbagbo’s acts of violence perpetrated against the people of Côte d’Ivoire. Human Rights Watch and Amnesty International have been condemning for years the persistence of reported human rights and humanitarian law violations against civilians in different parts of the country, including numerous acts of sexual violence met with impunity. What are the international effects of Cote d’Ivoire’s political instability? West Africa’s second biggest economy Côte d’Ivoire is the world’s largest producer and exporter of cocoa beans, which accounts for almost 40% of global production, and a significant producer and exporter of coffee and palm oil. Consequently, fluctuations in the production of those products affect world prices. The price of cocoa rose 36% between 13 September 2010 and 3 March 2011, over US$ 980 per tonne, as dispute on who was the winner in the last presidential election affected cocoa production. The country’s cocoa industry provides about 35% of government revenues. This income is essential for the current illegal incumbent, Laurent Gbagbo, to fund his bid to stay in power and explains his attempt to seize control of the industry. Aware of this and with the price of cocoa jumping 15% to US$ 3,669 per tonne, the internationally-recognised president, Alassane Ouattara, called last 24 January for a ban on cocoa exports. Although Ouattara did not control any security forces who could enforce the ban on the city’s ports, the call was expected to have some effect with major players in the world cocoa industry. Last week’s volatility in cocoa prices was evident, with a US$ 291 fall in just four days. The sharp decline was due to the possibility of a restart of cocoa exports as Gbagbo’s defeat was likely to take place.